This month's SSU topic was all about Gloves! One can never have enough pairs of gloves, in my opinion. How important are your hands? your wrists? Maybe you're an architect, a software engineer, a construction worker, a lawyer, a teacher, or a fabricator. No matter what you do for a living, I imagine using both of your hands is crucial to the success of your occupation. 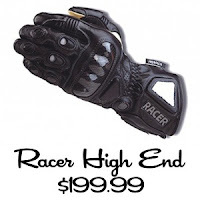 So why shouldn't full fingered, leather gloves be important while riding your motorcycle? If you think about how long a good pair of gloves can last (sometimes 5-10 years, if you buy the right pair), they are well worth every penny. 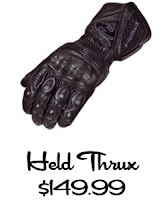 It can be hard to justify $100-$200 or even $300 for a pair of gloves. My wonderful friend Brian (you rule!) 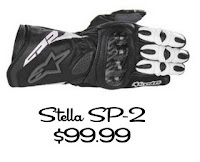 who works with me at Scuderia, gently reminds customers that if you take the average number of days a year that you ride (say 5 days a week x 52 weeks= 260) and divide it by how much you spend on one pair of gloves (say $100 for a decent pair of gloves with protection), that equals $2.60/day! Yes, these are ALL women's gloves! I would highly recommend the basic gloves for those of you riding scooters as well. The Olympias are probably the most popular scooter gloves that are sold at Scuderia. The Phantom goes down to a Size 6, which is pretty small for a race glove. 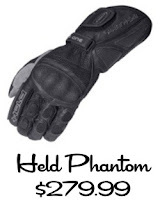 So if you have really small hands and need a fantastic glove, you'll love the Phantoms. Are they snug enough so that when they stretch they will still fit? Leather gloves will stretch so try to buy the snuggest size you can. How do they feel when working the throttle, clutch and front brake? Do you feel any extra 'bunching' of material along the palms, fingers? Remember that you'll never make a closed fist while riding, so assessing fit while opening your hands all the way and making a closed fist doesn't matter. You'll never fully extend your fingers straight out either, so remember that fit around the throttle is most important. When your hand is wrapped around the throttle, are your fingertips pushing up against the inside seam? Or do they just touch the inside? If they're just touching, that's normal. You just don't want added pressure onto the seam. Can you fit the gauntlet over your jacket? Or will your sleeves go over the gauntlet? Keep in mind that putting your gauntlet over your sleeve will keep you warmer and prevent air from going up the sleeves. For me, my hands are the second most important part of my body when I gear up. I hope they are for you too! 5:10pm Pacific / 8:10pm Eastern. I'm going to give my review of the REV'IT Ignition Jacket. As some of you may know, this jacket is made for men *and* women. So if you're a small, petite girl who needs a fitted, protective motorcycle jacket, you'll want to tune in. Or if you're a tall guy with a long torso, long arms and a narrow waist, you'll want to tune in too! It's that time again, I'll be calling in for another SSU podcast, all about helmets. Come and chat tomorrow night on SSU! I'll be on once again, talking alllll about Gear at around 5:30pm PT-ish. Sometimes I get pushed out to after 6:00, but who knows! I'm going to be giving my tips for finding gear that fits. The one thing I hear the most from every woman I meet is how difficult it is to find gear that works for their body type, and actually fits them. Well I'm going to help you do that remotely the best way I can. So tune in and listen to my tips! Click Here to listen to the show. Or if you can't make it tomorrow night, download the show from iTunes Here. A friendly reminder to catch me tomorrow night on Side Stand Up! The first of my monthly segments on the show. I'll be giving a brief review of the Daytona Ladystar boots and some general tips on buying boots and why you want these in particular! Click here to hear the show at 5:30pm PT tomorrow. Side Stand Up, First Tuesday every month! Well, my debut on the SSU podcast last month went so well that Tom, the show's host asked me to come back for a regular segment on the first tuesday of every month! I'll be doing a 18-20 minute segment on some aspect of women's gear and gear in general. So we'll have talks about fitment, how to shop, how to buy a helmet, what to look for when buying over pants, blah blah blah. I'll throw out reviews of women's gear every now and then as well. My next show is Tuesday April 7th, a week from today! To sign up and join the show, go to www.talkshoe.com and enter 64458 in the Search box. You'll see the SSU show come up and then you can join in from there.